Earlier this year I was interviewed for the Broadband Network 3 (BBN3) as a part of a story surrounding Second Life and real business. 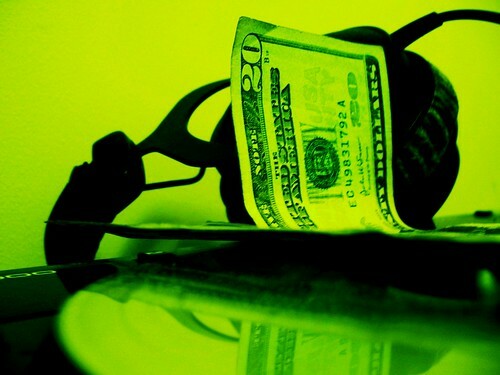 In this interview I talk about the merging of business and Second Life and my success as both a SL and RL DJ. The interview has on BBN3/New York, do check it out and leave a comment! I want to give a huge thank you to Bill Cumlic for an awesome interview, you can find more information about him on his BBN3 Network page. Friday, August 28th, 2009 will mark my 5th year within Second Life. 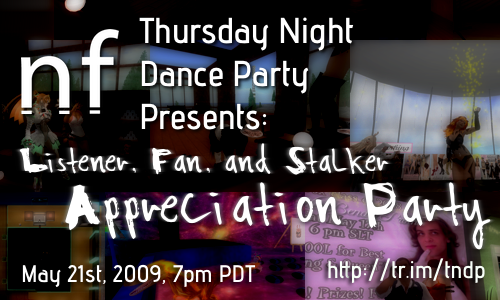 This week I’ll be celebrating these five years with my two weekly events on Thursday with the Thursday Night Dance Party (TNDP) at 7pm PDT (10pm EDT) at the Rouge Sim and on Friday (Rez Day) with Fusion Friday at 8pm PDT (11pm EDT) at Club Fusion. Come and enjoy both events, I would love to celebrate it with listeners new and old! The Black Eyed Peas have made the number 1 charts with their Electro influenced single Boom Boom Pow. There’s a few remixes available on iTunes, but this one by Brooklyn based producter Chew Fu brings the track back to its influence. There’s only one word that can describe Chew Fu’s remix, bumpin’. If you have a subwofer, crank it up to this song. I had to search the depths of my archive for this weeks Free Music Friday. Shipping Secrets, Fagan’s album released in 2007, has this silky smooth song Dante that calms and energizes the soul. Starting with a smooth female vocal, piano, and beat, the song continues an ambient style with a soft male vocal, layed next to a spoken word rap creating a silky smooth song. I just love how all of these elements merge together to create a wonderful track without being overbearing or destroying the songs element. I really appreciate the listeners, fans (and the “stalkers”) who attend my events every week. You are the reason I perform my weekly shows, the reason I stay up late some nights and keep on playing, the reason I DJ in Second Life. You guys make the experience worth it, and I want to show my appreciation! The next Thursday Night Dance Party is about the listeners, the fans, and you crazy stalkers who come, enjoy, and attend my events! In the next few days I’ll detail the shows particulars, but being it’s your night, let me ask: what would you like to see? Mix dubsteps texture, a soulful female voice, underlay ambient male voices and beats and give it a name reminiscent of Ghost in a Shell, and you have a perfect track that takes you back to the day The Matrix was popular. I can’t help describing Burial’s – Ghost Hardware without referencing Cyberpunk/Anime culture. It’s the musical version of the Animatrix, part tech, part soul, part ambient and creepy, all artistic with plenty of atmosphere to share. Getting hired in Second Life has evolved as the world has grown. When it was a much smaller community, word of mouth was the only way to get hired for an event. As the world has grown and the tools improved it requires a more work, but the method is the same. As a DJ, you always want others telling their friends about your events. There’s plenty of opportunity to do this, a new club is built every week providing a lot of opportunity and practice. In a few weeks you may be searching for another venue to request your services. The best way to maintain a steady flow of events within Second Life is by generating word of mouth, even if your hired for an event through word of mouth. The best way to be hired for an event is by word of mouth. There are plenty of non-club based events, such as weddings or private parties, that require the services of a DJ. This is how I am hired for a majority of my performances, even for large corporations. Nothing is better than a friend vouching for you as a quality DJ. The hard part is not making your friend look foolish. The end of your week has just gotten better. I’m going to be performing at Club Fusion (read as taking over the club) in Second Life, every Friday Night from 8pm – 10pm PDT (that’s 11pm – 1 am on the East Coast.) Club Fusion is a part of the Fusion Crossing an elite shopping district with a collection well known stores including *BOOM*, *Malt*, 7th Poses, ANA_Mations, BLACKLACE, Body Doubles, Cihuae Jewelry, Digit Darkes, Doux Petit Dahl, Fukmi Clothing and More, Heart & Sole, Heavenly Bodies, Kalnins Fashion, Karma, Kiana Dulce, La’ delicate, LustY, Magika, Mashooka Designs, Modd.G, MudHoney Designs, PIDIDDLE, Pretties by JB, Republica, Riviera Couture, RockBerry, Siamink Designs, Silhouette Shapes, Sugar Mill, Total Betty, Touche`, Zaara, ZHAO Shoes, and [marked]. With all of this great fashion and music, not only will you look great on Fridays but you’ll feel it as well.